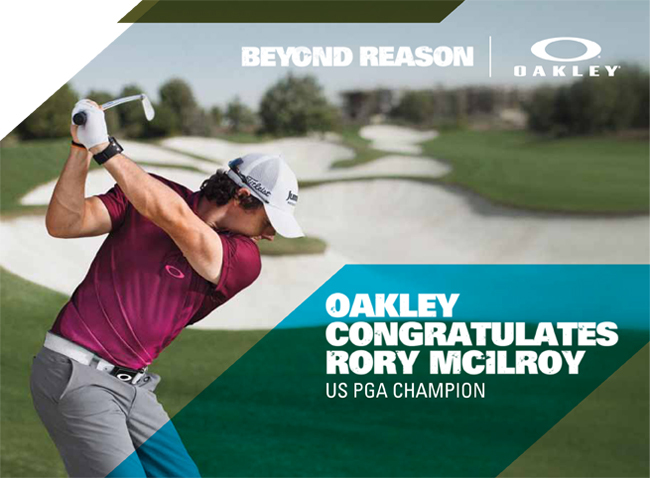 With all the fun of The London 2012 Olympic Games it was easy to miss the other big news over the weekend that Rory McIlroy became the US PGA Champion in South Carolina with a huge 8 shot winning margin. The win means that Rory returns to his World Number One spot. Oakley were obviously very proud of their prized sportman, who they dress from head to toe in all their gear to give him the best chance of winning. I love the way Rory is resting his Oakley Fast Jacket sunglasses up-side-down on the back of his head as he takes a swing in the image above. Oakley’s Fast Jacket and Fast Jacket XL sunglasses feature Switchlock technology allowing you to easily change the lenses to suit the changing conditions of the day. We’ve already written a couple of posts about Rory McIlroy in the past here and here, so make sure you check those out too. Contact Lenses and Glasses: A Match Made in Heaven?